Forget everything you've heard about stay-at-home moms. A new generation is starting their own businesses, blogging and working at home. I have tons of friends with similar experiences. They're not clones—today's stay-at-home mom (SAHM) may be a tattooed rock singer, the CEO of her own company or a green-living activist—but they all have something in common: a deep desire to be there for every moment of their babies' lives—the good, the bad and the unbelievably messy. If you're considering life as a SAHM, both sweet rewards and tough challenges await. Read on for insight and advice from experts and moms who've been in the trenches. There are 10.1 million women-owned businesses in the United States, says the Center for Women's Business Research. No firm statistics exist on how many are run by stay-at-home moms, but it stands to reason that the percentage is increasing in the Wi-Fi age. "Over 90 percent of the moms we've interviewed said the desire for family flexibility is the number-one reason they work from home," says Ellen Parlapiano, co-founder of mompreneursonline.com. "Another big change we've seen in the past 15 years is acceptance. In the past, moms have been reluctant to tell clients they work from home. Now it's commonplace, even respectable." Mom-owned businesses, which used to be heavy on arts and crafts, now run the professional gamut, says Parlapiano: Web design, attorney, marketing guru, social media coaching, you name it. Plug "mom bloggers" into a search engine and you'll come up with thousands of SAHMs who chronicle their daily lives online. Moms share stories and tips about single parenting, adoption, home schooling and more. The most popular blogs, like the Pioneer Woman and Dooce, turned their authors into celebrities who rack up book and movie deals. Jen Singer, the New Jersey mom of two who created mommasaid.net, says her blog averages 90,000 views per month; it's not a huge moneymaker per se, but it has led to book deals, speaking engagements and endorsement offers—none of which would have happened in the pre-Internet era. "Mom bloggers are hugely influential because they represent the authentic voices of other moms," says Jennifer James, founder of mombloggersclub.com, a community that's 10,000 strong. Making a living from a blog is tough, she adds, but there are other perks. "Moms who pen really great blogs are heavily courted by brands to review their product," she says. "Some receive thousands of dollars in products each month." When I first started working from home 15 years ago, I had never heard the acronym WAHM (work-at-home mom). The landscape has certainly changed; now, instead of "Work versus staying home?" the question for moms-to-be is often "What work can I do from home?" Brooke Hall, who runs a Web design business (brookehalldesign.com) and stays home with her 10-month-old son, Owen, is happy doing both. "I get to be here for the first giggle and step, and yet working from home gives me an identity other than ‘mom,'" says the 27-year-old from Dublin, California. "I'm still the same person I was before the baby—partly due to my continuing professional life." Working at home is still work, there's just not someone else telling you what to do and when to do it. The key to success is being self-motivated to haul youself out of bed at dawn and get cracking before the baby wakes up—or stay up past baby's bedtime, when you're likely tired too. Crossing your fingers and winging it is not enough. "Even before I had kids, I chose a profession that would allow me to stay home and raise children while working on the side," says Melissa Leonard, 37, a New York City etiquette consultant. "I've made it work by taking jobs when it's convenient for me—mostly on weekends when my husband can be at home with our baby." Nap time is almost always work time for WAHMs. "I'd almost hyperventilate running to the computer as soon as I got the kids down—I knew the time would be short, and so I had to make the most of it," says Shelley Hunter, 44, who runs a gift card website (giftcardgirlfriend.com) from her Danville, California, home. Even if it's a tiny corner of your dining room, you need a physical space devoted to work. "I turned a spare bedroom into my office, and it's set up just like any professional space would be," says Angela Halloran, 35, a web designer (boutiquewebdesigns.com) who lives in Noblesville, Indiana. "At the end of each work day, I close the office door and don't open it again until the next morning." "As a stay-at-home mom, I have a lot more leeway in my schedule when things go wrong," says Hunter. "When one of my babies got sick, I didn't have to call off work or find someone to watch him." You can also run errands during nonpeak hours—hitting the grocery store, the bank and the gym at 10 a.m. versus the 5:30 p.m. rush or scheduling doctor appointments and haircuts when it's most convenient for you, not your supervisor. Being an at-home mom allowed me to take advantage of opportunities that would have been difficult in the 9-to-5 world. If I wanted to have coffee with a nearby mom friend, for instance, we broke out the strollers and went. If I decided to volunteer at a church luncheon, I strapped Mathilda into her BabyBjörn and pitched in. If I felt like taking the baby to the park for an afternoon and playing peekaboo in the grass, I didn't have to clear it with anyone. At-home moms don't have to worry about toting the industrial-strength breast pump to the office or pumping in the bathroom. "Because I was home with my second baby, I was able to nurse him longer," says Stephanie Burchett, 30, of Pittsburgh. "My older son had asthma, allergies and a ton of ear infections as a baby, but the second one has no major health issues so far—I'm sure breastfeeding longer and being home helped." "Napping during the day was a huge benefit for me, especially after a wakeful night with the baby," says Sonya Braun, 37, a Winnipeg, Manitoba, mom of three. "Losing a lot of sleep at night takes its toll quickly!" 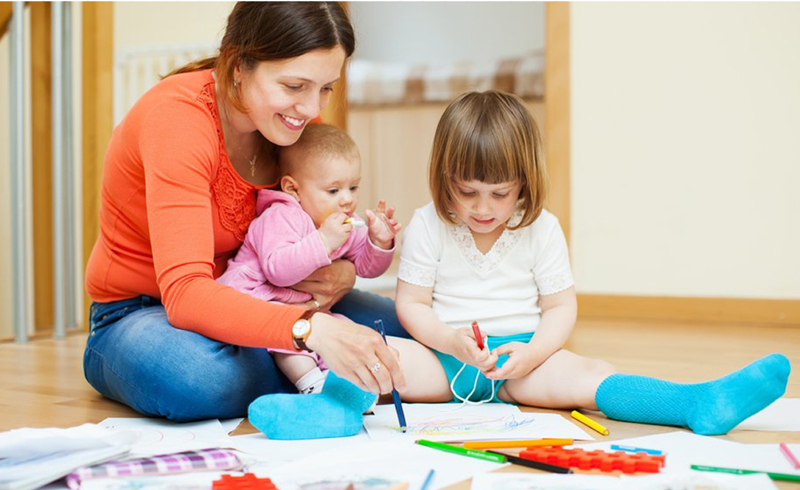 (or read Goodnight Moon 20 times a day) "If moms allow themselves to be ‘in the moment' with their babies, they find such raw happiness it is priceless," says Darla Shine, author of Happy Housewives and mom of two. "I would give anything to have one hour in the rocking chair nursing my newborns again." The infant stage flies by in a flash, she adds—being at home allows you to savor every day. She grows her own organic veggies, makes her own baby food and, of course, washes her babies' diapers in environmentally friendly suds. Her best friends are moms at Bible study, and family-friendly church events like pot-luck dinners figure prominently in her social schedule. She always has a project going—whether it's painting a mural for the nursery or selling her custom-made diaper carriers online; being a SAHM seems to inspire her creative side. Nap time is golden for the plugged-in WAHM. She has her laptop next to the nursing pillow, headset ready for a conference call and a pacifier handy at all times. Shelley Hunter always loved team sports but found making softball practice tricky with an unpredictable infant. "I signed up for tennis lessons to learn a more flexible sport. I only need one other person, and I can play at any time of the day." For me, reading a novel (as opposed to yet another baby book) provided an escape and kept me sane through the early weeks and months of motherhood. At the very least, glance at the newspaper every day to keep a little perspective on the wider world. "On Thursday and Sunday nights, my husband and I hang out in the family room," says Hunter. "We make popcorn, watch a show and snuggle on the couch together." Make a rule: Talk about something other than the baby for a certain amount of time. It doesn't have to be hours, 20 or 30 minutes is probably realistic. Switching gears for even a few moments is refreshing. "When my babies napped, I would take five minutes, sit quietly and enjoy a snack," says Stephanie Vozza, author of Five Minute Mom's Club: 105 Tips to Make a Mom's Life Easier. "It was a little break, but it made a huge difference in my mind-set."